This year’s NextGen Series is home to one striker who’s taking it by storm – Jean Marie Dongou. With six goals in as many matches, he is the current tournament top scorer and with his club, Barcelona, progressing through to the knockout stages, there is surely more to come from the youngster. The 16-year-old is described as the new Samuel Eto’o, being Cameroonian and representing Barcelona and hopefully contributing years of service in the future to the Catalan club. One year ago, Dongou was creating hype across Europe as being regarded as the next Messi and still maintains his flourishing reputation. The youngster is fast and powerful, much like a Romelu Lukaku sort of individual. He is also instinctive and opportunistic and is keen to emulate the heights of Barcelona legends such as Eto’o and Messi. He is regarded the brightest prospect currently within the Barca academy and is creating a huge buzz around the Nou Camp. Insiders at the Spanish club believe that Dongou could make his professional debut within two years and they believe he will take La Liga by the scruff of its neck and really impress on the big stage. Amongst Dongou’s impressive goalscoring achievements so far in his career was a spell in which he scored 20 goals within 14 days, a good record by anyone’s standards. He has also scored over 70 goals in one season at youth level and every year seems to top the goalscoring charts despite being a great deal younger than most of the opposition and his fellow teammates. There isn’t much media coverage at the moment regarding Dongou but after the NextGen Series I am confident that Dongou will be regarded even higher in the football world and we could see a lot of this teenager in the coming years. 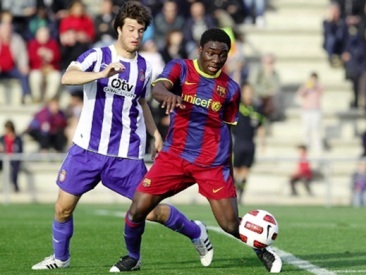 Until then, keep with The Youth Radar for updates on the NextGen Series and the career of Jean Marie Dongou. Both Deulofeu and Rafinha were promoted to Barcelona B this summer. The team competing in the nextgen series is the Juvenil A team. I’d perpetually want to be update on new blog posts on this web site , saved to favorites ! . I’m not sure where you’re getting your info, but great topic. I needs to spend some time learning more or understanding more. Thanks for magnificent information I was looking for this Rising Talent: Jean Marie Dongou The Youth Radar for my mission. Thanks for the marvelous posting! I definitely enjoyed reading it, you may be a great author.I will remember to bookmark your blog and will often come back in the foreseeable future. I want to encourage you to ultimately continue your great job, have a nice day! Usually I don’t learn article on blogs, but I wish to say that this write-up very pressured me to check out and do so! Your writing taste has been amazed me. Thanks, very nice article. Rather than produce exactly the same old content material you have taken this subject to a whole new level . Kudos for not following the standard writing crowd. Useful info. Lucky me I found your website accidentally, and I’m shocked why this coincidence did not came about earlier! I bookmarked it. Hey very cool website!! Man .. Beautiful .. Amazing .. I’ll bookmark your website and take the feeds also…I’m satisfied to search out numerous useful info right here within the post, we need work out more strategies on this regard, thanks for sharing. . . . . .